Mongo is the new healthy alternative for lunch or dinner! Come in and create your very own stir fry. 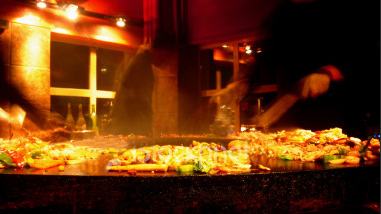 You pick the meats, vegetables, rice and sauces you desire and we will cook it for you on a flat grill. Lunch specials start at $6.99 and dinner specials start at $7.99. Mongo is located on veterans parkway just north of Golds Gym Max. We will be providing more information about Mongo on this website, so check back often. Mongo opened its doors October 2009 and has immediatly established a reputation as a premier dining destination in Columbus Georgia. (c) 2009 Mongo Grille.com • Designed and hosted by PC Assistants Inc.